I wanted the table to be casual and feel like a Fall evening... warm, cozy, seasonal. I created this Fall Table setting using pumpkins I had gotten to display around the house, a plaid wool wrap, ticking stripe napkins, and pewter candle sticks. Notice everything is in the same color family, but it is not matchy-matchy. I like the mix of stripes, plaid and the floral scroll on the plate. Sometimes I think using over-styled centerpieces seems a little too "planned" for the casual dinners I like to host. I feel a little silly when I've put together a very elaborate table and centerpiece for a simple, rustic dinner party. So, I used a cinderella pumpkin as the centerpiece for this table - couldn't be easier. 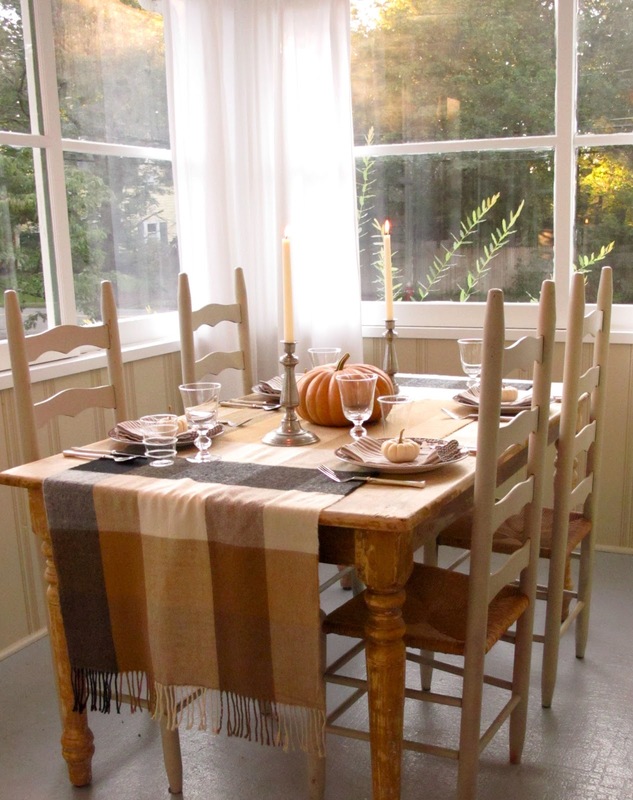 It is seasonal and beautiful, and you're guests won't ask, "Wow, who's coming for dinner?!" when they see the table. I used my Spode Woodland plates we received as wedding gifts, a mini white pumpkin (you could also use , brown and cream ticking stripe napkins and silver flatware. 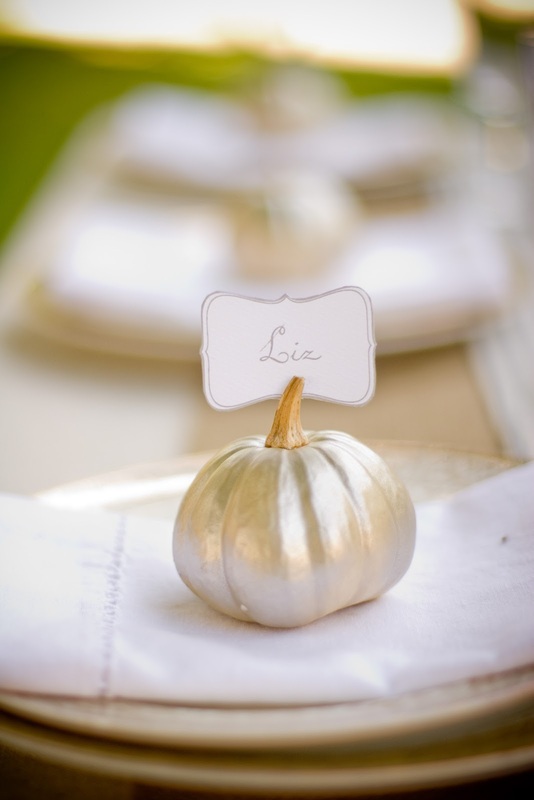 If you'd like to have assigned seating, you can use the mini pumpkins as holders for the name cards like I did in this Fall Wedding/Party Inspiration Table Setting. I'm also considering doing a table setting that had a monotone color scheme. Wouldn't these look great painted a soft almond grey color with white plates, linen napkins and blue pumpkins? Stay tuned for that! The plaid wool wrap was a steal from H&M when we were in Italy. I think it was $18! Candlelight is always appropriate for dinner - can't you imagine sitting around this table for hours with great conversation?